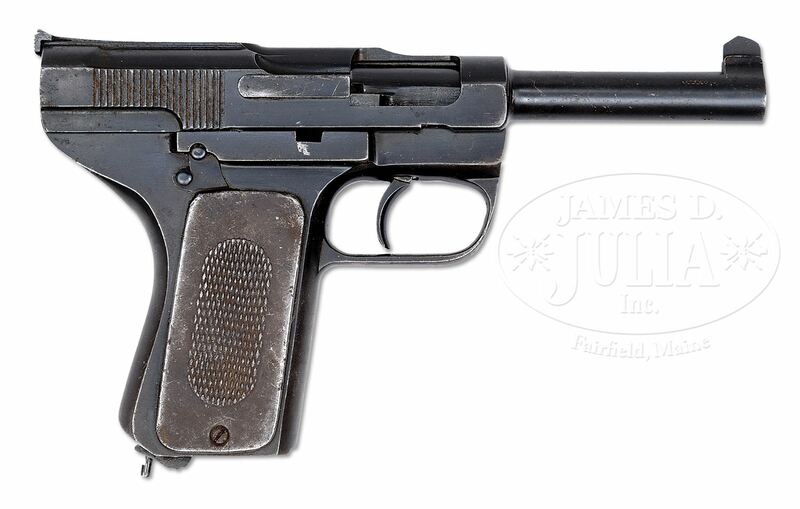 One of the lesser-known small arms makers of 20th Century Western Europe was the Dansk Rekylriffel Syndikat A.S., Copenhagen. 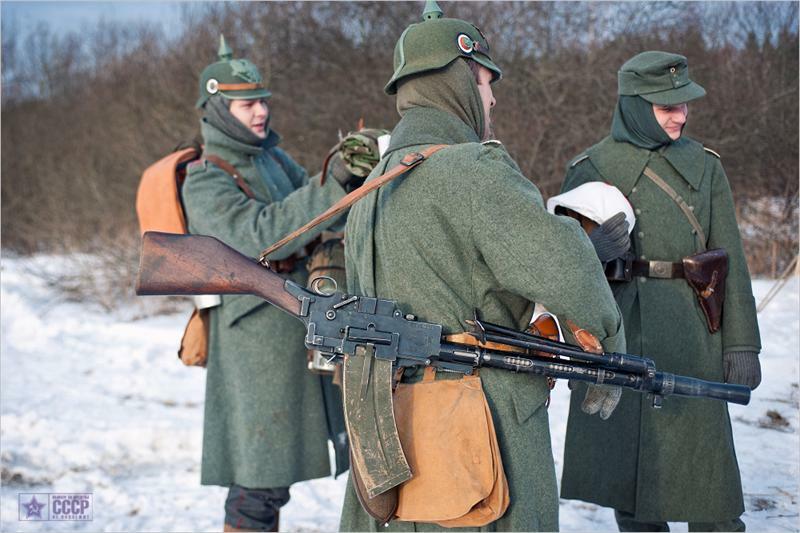 This Danish firm produced a number of variants of the guns of one Lt. Jens Theodor Suhr Schouboe (pronounced ‘Shoobow’) of the Royal Danish Army (who was also one of the brains behind the classic Madsen light machine gun). These pistols included the Model 1902, 1906, 1907, 1912 and 1916. Never really popular only a few thousand total guns were made and at least some were purchased in a contract for the Danish border police during WWI in the interest of “keeping it local” since the neutral country was caught between the British blockade and the Germans. The designs were very interesting using a blow-back action and (in the 1902, 1906 and 1907 pattern) a .45 caliber cartridge that fired an aluminum-jacketed wooden cored bullet (not making this up) that would zip out to 1600 fps while not having a lot of recoil. One was even tested by the U.S. Army but rejected. 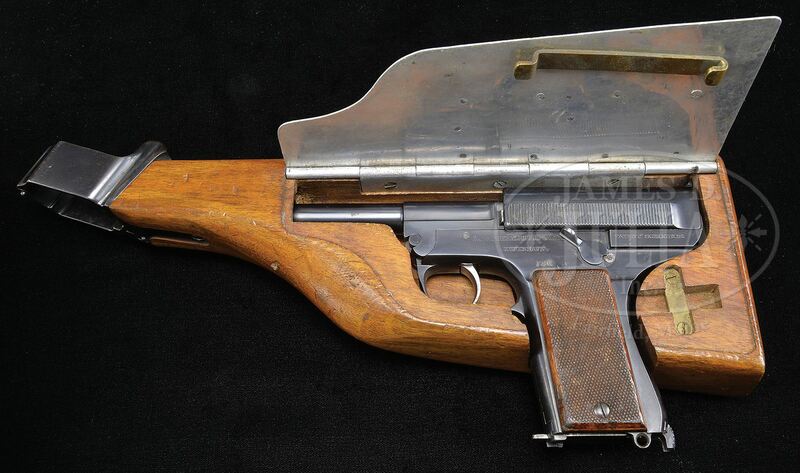 Anyways, two of the rare M1906 guns are in the upcoming Julia auction. DANISH M1906 SCHOUBOE, FIRST VARIATION, METAL GRIPS. 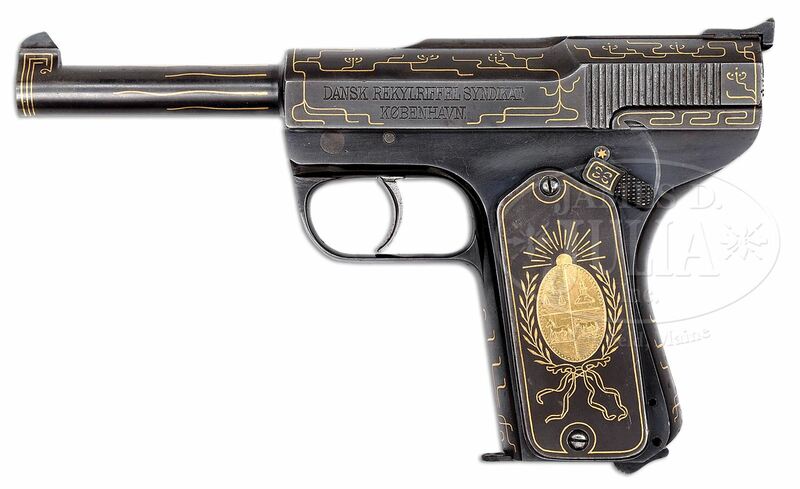 DANISH M1906 SCHOUBOE, FIRST VARIATION, GOLD INLAID, PRESENTATION TO PRESIDENT OF URUGUAY. My homie Ian over at Forgotten Weapons has more background on these interesting pistols.